Born in Hyogo in 1967. Tosa formed art unit Maywadenki in 1993. His unit was named after the company their father ran in the past. Tosa’s unit performs, wearing blue work uniform and calling art piece Product and live performance Product Demonstration. in the style of the small-and-medium-sized companies which enabled Japan to achieve such a high rate of economic growth in 20th century. Meiwa Denki make appeals of art pieces including non-sense machine in the fish motif NAKI, original music instrument series TSUKUBA. Not bound by the art standard, Tosa constantly looks for new ideas in expansion of promotions not only exhibition and live performance but also and distribution after turning art pieces into toys and electric devises. 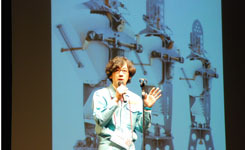 Meiwa Denki won Japan Toy Awards 2010 in High Target Toy category. They actively address a variety of activities all over the world such as installation in ARS Electronica and Media Arts Festival in Vienna.